Today, women earn a relatively low percentage of computer science degrees and hold proportionately few technical computing jobs. Meanwhile, the stereotype of the male “computer geek” seems to be everywhere in popular culture. Few people know that women were a significant presence in the early decades of computing in both the United States and Britain. Indeed, programming in postwar years was considered woman’s work (perhaps in contrast to the more manly task of building the computers themselves). 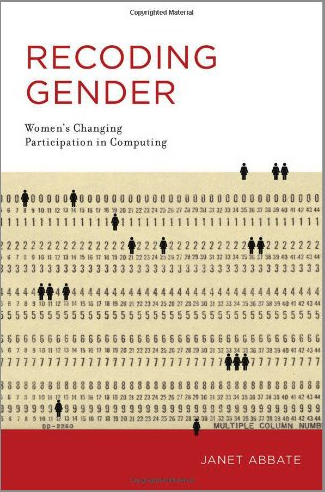 In Recoding Gender, Janet Abbate explores the untold history of women in computer science and programming from the Second World War to the late twentieth century. Demonstrating how gender has shaped the culture of computing, she offers a valuable historical perspective on today’s concerns over women’s underrepresentation in the field. Abbate describes the experiences of women who worked with the earliest electronic digital computers: Colossus, the wartime codebreaking computer at Bletchley Park outside London, and the American ENIAC, developed to calculate ballistics. She examines postwar methods for recruiting programmers, and the 1960s redefinition of programming as the more masculine “software engineering.” She describes the social and business innovations of two early software entrepreneurs, Elsie Shutt and Stephanie Shirley; and she examines the career paths of women in academic computer science.